Wind-blown snow coated the stunted larch trees at the top of passes. It was scenery out of a postcard imagination. As the dates from the last Up-Date indicate, there was a span of twelve days between our first arrival in Khandyga and our departure for Yakutsk. Arriving at the truck staging station in Khandyga, we pulled into a guarded compound in which a dozen transport trucks sat in the snow, engines running. We parked in front of one of the mechanics’ barns. These were long drive-thru buildings, each capable of holding three to four trucks over a greasy grease pit the full length of the building. Tolik was a smart guy. He was the chief of truck maintenance at the Khandyga dispatch yard, but he had his fingers in other deals, and he knew everyone. It was cold, about -60°F (-51°C). We started the generator, plugged in all the 110-volt heaters, and shut the engine off for the first time in four days. I needed to check the oil. A cluster of curious grease monkeys had gathered around the truck. It was still much too cold to pop the top up. Monika was heating water for coffee, and I had just stepped out to see if everything was OK when a big gruff looking man approached. The grease monkeys cleared a path, and he made a motion for me to follow. We walked through the snow to a huge truck storage barn, and he pointed to an empty spot. The indication was clear. Move our truck to a warmer place! We gratefully did! An hour later, parked in the relative warmth of the barn, slightly above freezing, we followed our new friend across a field to a tidy house with a large enclosed courtyard. His pleasantly plump wife came to the door, and she was informed, as only a Russian man can inform a wife, that we were invited for lunch, and Yuri and Misha would join us. While food was being prepared, Tolik led us to an outbuilding and with simple words and sign language, showed us the ropes of operating the family banya. For the next hour we steamed, dumped cold water over our heads, and steamed again, beat our bodies with birch branches, and steamed again. What a great feeling to be clean! Tolik was the service manager at the truck maintenance center. It was interesting to see a man who had moved out of the “Communism” mentality. In his small yard, he raised chickens and sold eggs. He had four pigs which he periodically slaughtered and sold. He had two cows which gave more milk than his family needed. He had built a nice home with running water and indoor flush toilets! In other words, he was totally into Capitalism. A typical Russian meal of roasted chicken, bread, potatoes, cheese, salami, beets, and other pickled vegetables. Everyone has a glass of fresh berry juice. 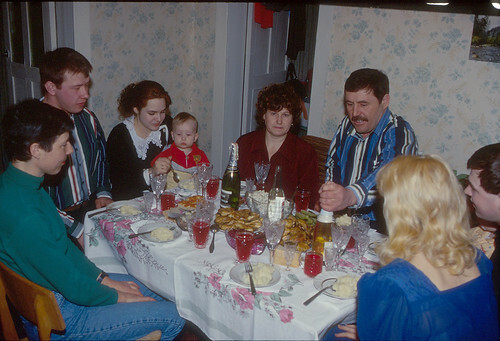 The men drink vodka and the women switch to “champanski”, a light sparkling wine. Sitting around the kitchen table for a typical Russian meal of roasted chicken, bread, potatoes, cheese, salami, beets, and other pickled vegetables, I believe we were on our third of the socially mandatory three shots of vodka when it occurred to me that the 357-mile trip from Ust Nera we had just driven in company with Yuri and Misha had been difficult and dangerous, but spectacularly beautiful and exciting! This was the Siberia we had come to experience, and looking at the Topo maps, we could see our route ahead was mostly flat. We just had to see it again. I communicated this idea to everyone, and they were delighted. Tolik said we could leave our trailer in his yard. Yuri and Misha had picked up a load of diesel, and the next morning we were on our way. The Russians thought we were crazy. Now they were sure! Yuri and Misha had accompanied us from Ust Nera to Khandyga on the first trip, and they were delighted to let us tag along for a return adventure. Starting out in the morning, we crawled along for a few miles at 5-mph, waiting for the gear oil in our differentials to become liquid again. As we drove along, heater and defroster blasting, we became aware of a horrible burnt oil smell. I looked down to see a small puddle of black oil on the floor mat. Had disaster struck already? We stopped to investigate with dread and fear in our hearts. Heading back to Khandyga for the second time, we faced the spectacular mountains with some trepidation. It was a joy to drive without our support trailer. Turns out, all Russian trucks leak. Parked all night with the engines running, the dripping oil hits the frozen ground, and at -50° F or so, it solidifies almost instantly. This creates a little cone of motor or transmission oil, like a mini stalagmite several inches high. When it snows, they are hidden. If you step on one, it smooshes into the tread of your boot. Of course, as the boot warms, the oil becomes liquid again. We called them “grease turds”, and quickly learned where not to walk. About sixty kilometers north of Kyubyume, just about in the middle of nowhere, Yuri’s Kraz blew a clutch, stopping him on the side of the road. In the bitter -50°F cold, there was no way to make repairs, even if parts were available. He had plenty of fuel to keep himself and his engine warm, so we continued on. We would send help. There were no cell phones, and he could not leave his truck and cargo unattended. We would cross these mountains three times before we were content. This was the Siberia we had dreamed of. Crossing the El’gi River, 64 miles out of Ust Nera, a tanker truck had broken through the ice into a foot and a half of water. The hole was about 60 feet across. We had the option of driving around on ice of unknown quality and depth, or trying to follow the big six-wheel drive Krazs through the freezing water. With the ice about a foot thick, the drop-off to the gravel river bed was over two feet, at a slight angle. I shifted to low-range, 2nd gear and locked both ARB differentials, held my breath, and eased over the edge. The Turtle IV sloshed into the icy water, the front bumper partially submerged. I needed to hit the other side with enough speed to give the tires a little help in lifting up the front of the truck, but not so much as to damage anything. The back bumper drug as the rear tires dropped into the river. We were committed, to say the least. A little to my amazement, and much to my relief, the front tires grabbed the ledge of ice on the other side and pulled themselves up with a crunch and a groan. The transfer case cleared, and the rear wheels followed with a bump of hesitation as they spun, jerked and clawed up the ice shelf. In retrospect, we probably whacked the rear drive shaft. We had made it, but at -41°F, the entire underside of the truck was sheathed in ice. Tires and wheels were also coated like giant white glazed donuts. It took several miles to melt the ice out of and off the brakes. 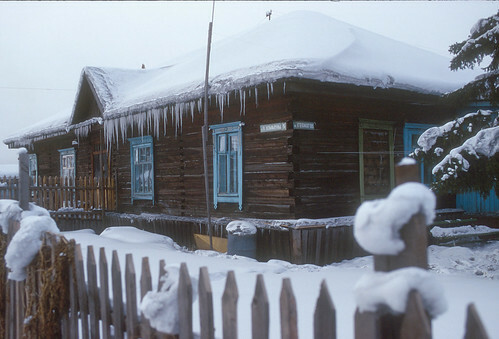 Many homes in Siberia are made of logs. Newer ones like this are perched on stilts above the ground to keep their warmth from melting the permafrost. Older homes had sunk into the ground as much as two or three feet! Everyone welcomed us back to Ust Nera. We camped outside the truck barn for two days. There was no room inside for us. We spent two more enjoyable evenings with Sonja and Sasha, and more time late at night talking with Georghe, the old Ukrainian night guard at the truck barn. (see Up-Date #4) Monika discovered while washing out a tea cup that if you toss boiling water up into the air, it explodes like little firecrackers and falls as teardrops of ice! Habitation fog obscures the winter sun on most days. With luck, it may burn off in the afternoon. 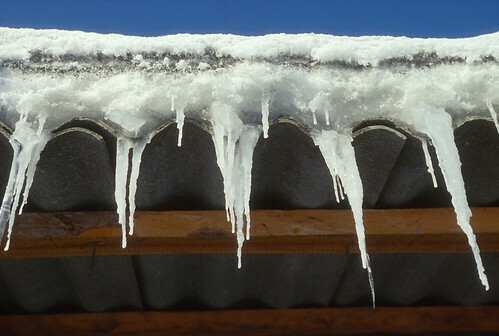 Heat from roofs creates beautiful icicles. This is modern Russian construction in Eastern Siberia, using a standardized corrugated cement panels and little insulation. Properly registered and recorded, we left the next morning. Misha had unloaded his tanker of diesel at a mine. Yuri had not arrived, and we were worried. We headed back toward Khandyga. Yuri was still with his disabled truck. He eventually camped there for eight days before help arrived. Passing truck drivers gave him food and water they could spare. Think about that the next time your emergency towing service tells you it might be an hour. The hospitality of Tolik’s family was wonderful. 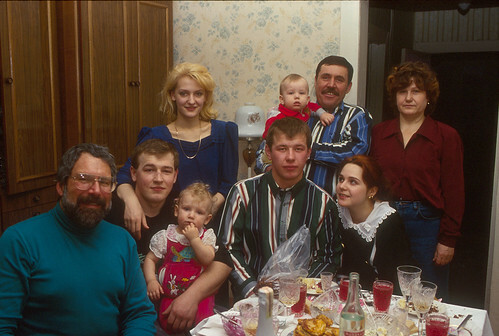 It would become typical of every Russian family we met on our adventure across Eurasia. 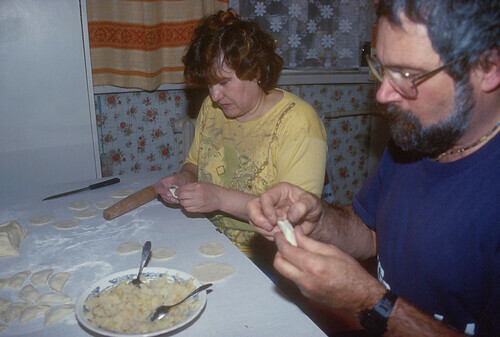 Tolik’s wonderful wife showed us how to make pilmjeni, a Russian specialty of little dumplings stuffed with potato. They are cooked in boiling saltwater and coated with butter. Returning to Khandyga, we took time to soak up some more Russian hospitality. It was an opportunity to meet some great new friends. For most of these people, we were the very first outsiders they had ever seen. Some had learned a little English in school, but had never spoken to a foreigner before. There were many questions to struggle through with our limited Russian vocabulary. 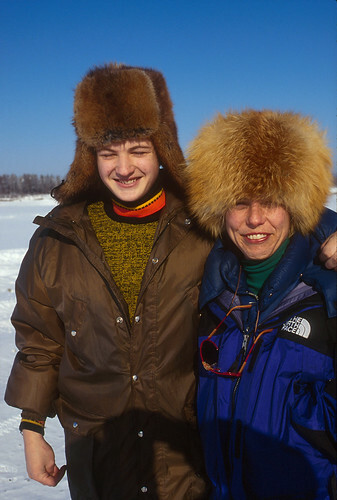 We learned new recipes in their kitchens, drank vodka in the Russian tradition, and sweated in their Russian “banyas” or saunas, while we took time to look around this old river port and Gulag. Several days in a warm truck barn gave us time to melt the ice off The Turtle’s undercarriage. Vadim was a great kid. He and his family showed us around Khandyga and took us to their dacha. Monika pretends to be Russian with Vadim’s mother’s fur hat. A rear pinion seal had started to leak, perhaps caused by the traumatic plunge into ice water or the thump the driveshaft may had received. We were able to change it in Khandyga. Thankfully, we had brought a Posi Lock puller with us, which was essential for removing the U-joint flange. Local grease monkeys watched the process, offering any help they could. They had very minimal tools. Our torque wrench seemed of great interest to them, and the use of Permatex ThreadLocker on studs caused a raise of eyebrows. One mechanic presented me with a 30 mm socket as a gift, having noted that I did not have this size. A bottle of Brute after-shave, a Rain-X Motorsports license plate, and a hand full of extra sponsor stickers were gratefully accepted in return. One day a young boy approached us. Vadim wanted to practice his English. We were invited to his home for a wonderful dinner, and later, he and his mother gave us a tour of the town. As with most Russians, they were very proud of their dacha and vegetable garden. Vadim’s mother drove us in their little Lada Niva, which was unusual. Few women drive in this part of Siberia. She was delighted when we gave her some packages of flower and vegetable seeds we had brought from home. There is no all-weather road from Khandyga west to Yakutsk. In the Spring, Summer and Fall, all traffic comes by river, down the Lena from Ust Kut (56° 48′ N / 105° 48′ E), to Yakutsk, to the Aldan River, and then upriver to Khandyga. This makes Khandyga very important, for all supplies which are not flown into the Northern Russian Far East must come by road from the Pacific port of Magadan, (where we started), or by river to this port. For example, most fuel used in the mines—gas, diesel and oil—is transported in the Summer by barge to Khandyga where it is stored until Winter and trucked out to places like Susuman and Ust Nera on the road we had just followed. The only for sure time you can drive from Khandyga to Yakutsk and on to the West is during Winter!!! The muddy track may be passable at other times, but it’s an iffy option. 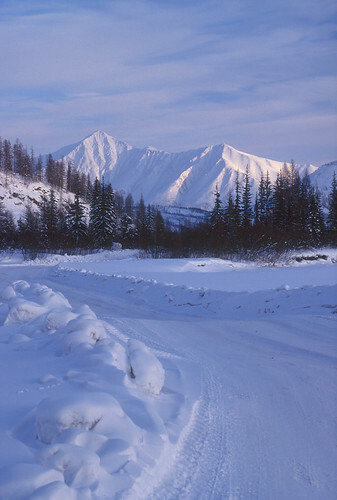 The drive from Khandyga to Yakutsk can normally take twelve hours. We had arranged to travel with Vladimir Gladkoshchekov, the chief engineer of the Khandyga truck terminal, who had business to attend in Yakutsk. 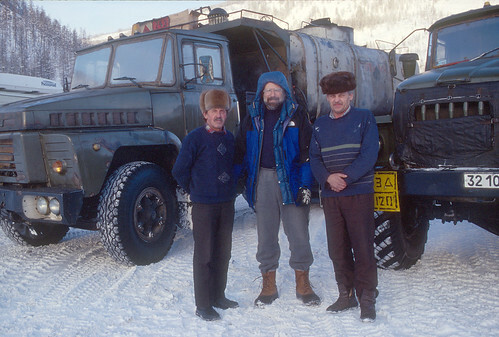 Nikolai, the driver of their 4X4 van, was a friendly guy who patiently waited for us at every dubious intersection. We followed a typical Russian schedule: Get ready to get ready at 8:00 AM. Prepare to get ready at 9:30 AM. Get ready to leave at 10:30 AM. Get ready to wait at 11:30 AM. Get ready to eat lunch at 12:00 PM. Start getting ready again at 1:00 PM. Leave at 2:30 PM. Drive the last half in the dark. In the end, there always seems to be some obscure “document” missing; a piece of paper typed in triplicate using carbon paper and rubber-stamped by someone important who is not to be found. Crossing the Aldan, locals had cut huge blocks of ice from the river and stacked them for use during the Spring and Summer when the rivers are polluted with runoff. In the permafrost, there are no wells. Cellars are freezers all year. The two-lane graded road over packed snow out of Khandyga soon turned to one lane as we passed through rolling hills and the occasional abandoned village. At 62° 42′ N / 134° 40′ E we crossed over the Aldan River, the major waterway joining with the Lena. A small native village on the other side looked lived-in. 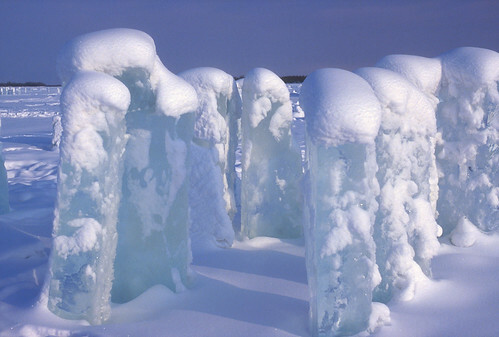 Locals had cut huge blocks of ice from the river and stacked them for use during the Spring and Summer, when the rivers are polluted with runoff. In the permafrost, there are no wells. Cellars are freezers all year. The deeply-rutted two-track was extremely icy. Our usually-obedient support trailer thrashed wildly behind us, sometimes leaping into the air like a mad dog at the end of a leash, yanking the truck sideways as it landed and bounced back into the tracks. The woopdeedoos were unavoidable. 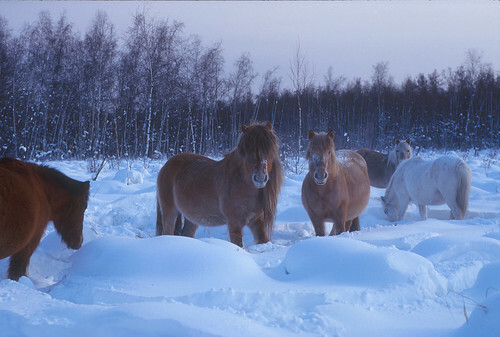 Yakutian ponies are raised for meat in this part of the country. Their thick coats protect them from the extreme cold. Long manes and tails must help ward off the swarms of mosquitoes in the Summer. Fermented mare’s milk and horse tongue are local specialties we are sure to try. We saw several herds of the shaggy Yakutian ponies which are raised for meat in this part of thecountry. Their thick coats protect them from the extreme cold. Long manes and tails must help ward off the swarms of mosquitoes in the Summer. We watched them paw the ground, searching for grass and moss, their heads hidden in the snow. Fermented mare’s milk and horse tongue are local specialties we are sure to try. 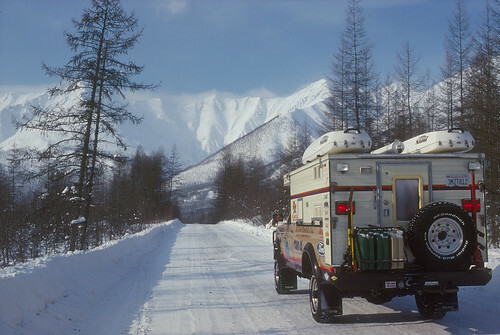 We have left the sometimes-ambiguous area called the “Russian Far East”, and entered officially into “Siberia”, and we are beginning to feel less need for traveling in the company of a convoy. Villages are more frequent now, and though it is still -30°F at night, Winter has turned the corner on its way to Spring. There is less chance of any serious weather problems, or so we think. Arriving in Yakutsk, we were given the red-carpet treatment. Our three-room suite at the “auto base” (truck transport center) hotel is luxurious by Russian standards, and Turtle IV was safely parked in a truck barn at a toasty 55°F. Having now been on the road—since leaving Seattle—for over a month and a half, we had a lot of work to catch up, including these Up-Dates and some normal maintenance on the truck. We washed clothes in the bathtub, and cooked most of our meals on a Coleman Peak 1 backpacking stove. We even got to watch a little Russian television. Yakutsk was founded as a Cossack fort in 1632, and has since served as a base for many expeditions to the Russian Far East. 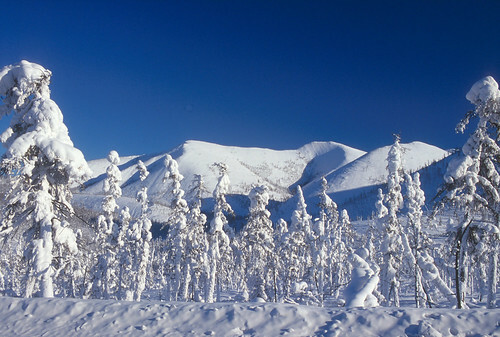 Isolated by thousands of miles of mosquito infested swamp and taiga four months of the year, and frozen solid the other eight months, it can hardly be considered a hospitable place to live. Its remoteness made it a place of exile for social and political dissidents, a prison without walls. 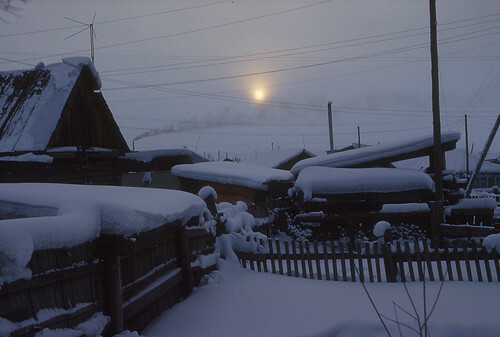 Despite all this, over 190,000 people make Yakutsk their home. There are theaters, hotels, museums and a university, a dramatic change from some descriptions which likened the city to a lawless “Wild West” town of bars and brothels only a few years ago. We even saw our first church here, a beautiful wooden building with the classic onion domes. Yakutsk is also the location of a branch of the Russian American Business Education Center, a U.S. federally funded program organized by the University of Alaska to help Russian citizens learn the ways of the free market economy. Director Cliff Gilman and Coordinator Sean McKee, along with their friendly office staff, graciously assisted us with our every question and need. We are still researching the route we will follow west and southwest from Yakutsk. At this writing, it appears that contrary to all previous information, the Lena River, though six miles wide where we drove across coming from Khandyga, and frozen to a depth of five meters, is not driven on directly out of Yakutsk. Our U.S. Military Defense ONC and TPC maps show there is a road along the bank, but no one seems to know about it. In the end, our route may take us away from the river to the town of Suntar (62° 09′ N / 117° 37′ E), and then back to the Lena at Lensk. From there, we can follow a Winter road on or along the Lena to Ust Kut. The next leg of our adventure must be done before rivers and ice roads get too soft, and the drive itself will take over a week, just to Ust Kut. We are watching the weather carefully while we investigate all our options. 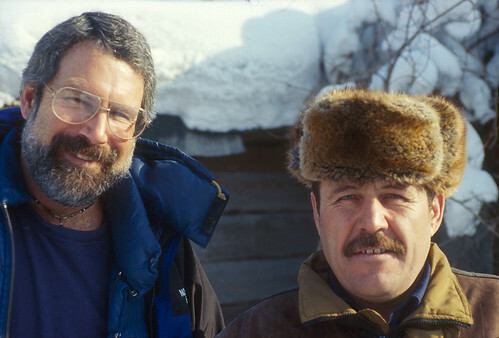 Once we leave Yakutsk, it may be several weeks before we can use e-mail again, perhaps not until we reach Irkutsk near the southern end of Lake Baikal. Mileage from Khandyga: 257 (414 km). Total driving time: 15 hours. Road condition: Hard-pack two-lane to icy one-lane with many turns and small hills. It becomes two-lane again closer to Yakutsk. There were two river crossings. Fuel was available. Four-wheel drive would be advisable on “Winter road” sections.